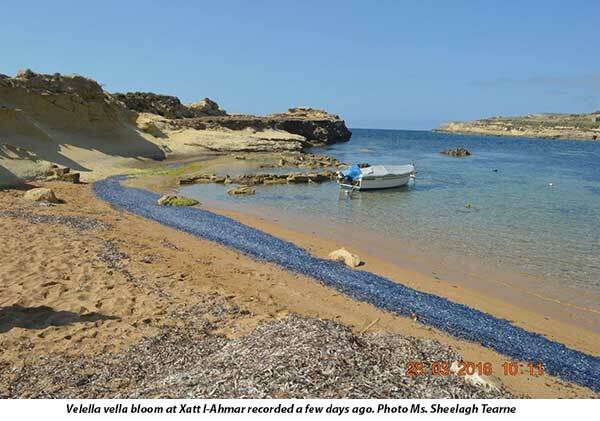 Once again this year, the living miniature sailing boat, known as the ‘by-the-wind sailor’ (Velella velella), kept its appointment and showed up on Maltese beaches, as evidenced by the numerous reports of the first blooms (large aggregations) lodged with the Spot the Jellyfish team by the public for the beaches of Xlendi and Gnejna. This year, the team had first reported the species in late January but the first blooms have been reported over the course of last week. Prof. Alan Deidun, from the Physical Oceanography Research Group at the Department of Geosciences, who heads the Spot the Jellyfish team, explained how this species normally appears in our waters between late January and May and that blooms of the species are normally recorded from beaches along the western flank of the Maltese archipelago since, in the Mediterranean, the species is restricted to the western half. 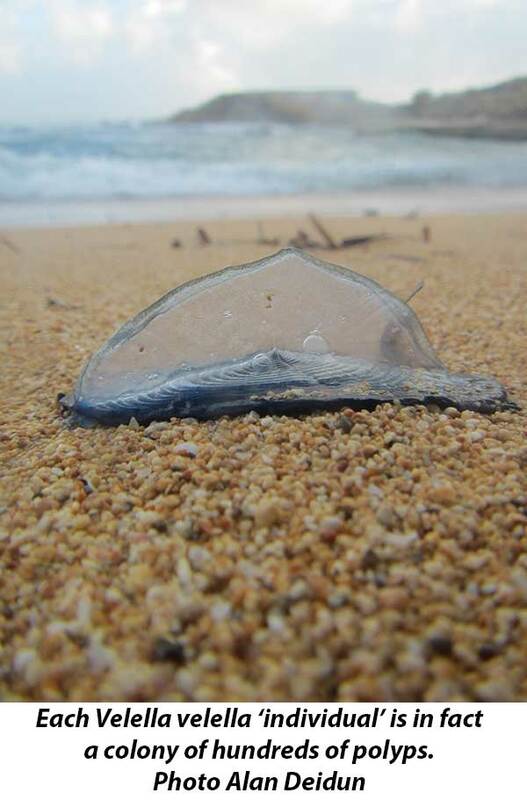 This dark-blue fascinating species, often mistaken as a single jellyfish individual, is actually a floating colony, propelled by means of a 6cm-wide triangular flap, made of chitin, which acts as a veritable sail, beneath which are thousands of separate 3mm-individuals surrounding a large central mouth. The float contains a number of sealed air-filled compartments which ensure its buoyancy. Velella is consumed by a number of unusual molluscs, which are pelagic or floating, rather than being anchored on the seabed, such as the purple common snail (Janthina janthina) which floats by means of a bubble raft is secretes, or the blue dragon (Glaucus atlanticus), a species of nudibranch which even feeds on the venomous Portuguese man o’ war. Dangling below the float are also short tentacles which ensnare unwary plantkonic individuals but which impart only a mild sting to humans. 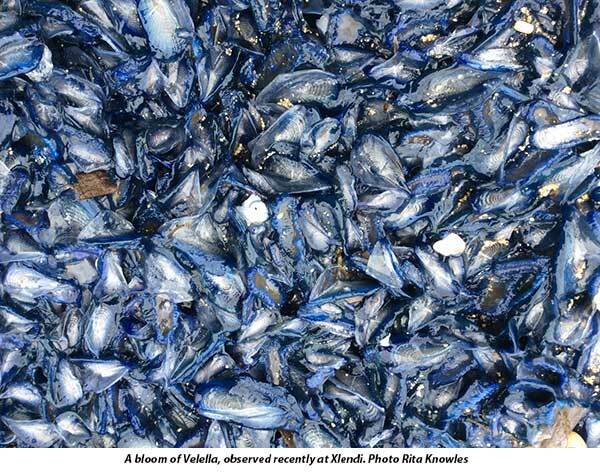 Velella is a cosmopolitan species, being known from warm, temperate seas all over the world. Perhaps the most intriguing aspect of the species is the fact that two types of floats, which are actually mirror images (like gloves on different hands) of each other, exist within the same population such that the entire population is not propelled in the same direction but is dispersed in different ones. The Italian monicker for the species is ‘Barchetta di San Pietro’, translating into ‘St. Peter’s small boat’, yet another marine species being named informally after St. Peter (for instance, the John Dory fish is also alternatively known as St. Pierre or Peter’s fish. The Spot the Jellyfish initiative, which is funded currently by the International Ocean Institute (IOI) and which has been running since June 2010, enjoys the support of the Malta Tourism Authority (MTA) and of Nature Trust, Friends of the Earth, EkoSkola, the BlueFlag Malta programme and Sharklab. The initiative was the brainchild of Prof. Aldo Drafo, who heads the same research group within the Department of Geosciences. The reporting is done by simply matching the sighted jellyfish with a simple visual identification guide, giving the date and time of the sighting, and indicating the number of jellies seen. Sightings can be also reported online (www.ioikids.net/jellyfish), or by sending an email message to ioi-moc@um.edu.mt or to alan.deidun@gmail.com. Strange jellyfish not included on the leaflet should be caught and kept in a bucketful of seawater, prior to contacting staff at the Physical Oceanography Research Group for retrieval to attempt a definite identification of the species.